Migraine stops play: repost day. 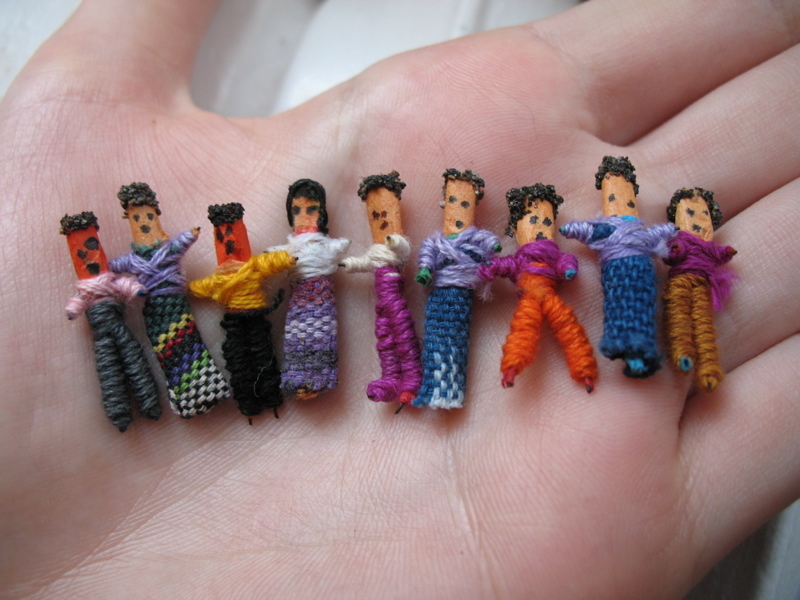 This one’s early and uncut so make a cuppa before you read….I think the fourth worry doll from the left is Elvis. My cat doesn’t travel far. She is no globe trotter. This is her route: nag someone mercilessly into opening the front door. Stroll nonchalantly down the drive. If the sun is shining, sit down at the bottom of the drive, allowing the gentle wind to riffle one’s fur, infuriating a few dogs that live across the green. Lie down. Doze to the frenzied barking of any canine observers: this is music to any cat’s ever-vigilant, perfectly cocked little ears. After a pause as interminable as possible, get up and amble to the right of the house. There lies a path which leads to the forest. Take a seat. Put up one’s paws. Try violating a neighbour’s personal space. After a satisfying interval – just long enough for the neighbour to ferret around in their kitchen cupboard for their “Get Off My Garden” anti-cat miracle spray, but not long enough for them to re-emerge with it – potter right again to the garden fence. Now I have never seen this next bit. I have never worked out how my incongruously named feline householder, Kit Kat, gets from outside the eight-foot garden fence, to inside the eight-foot garden fence. By some mystery only known to the brotherhood of Felis Catus, she dematerialises on one side, and materialises on the other. Lewis Carroll was not kidding. They do that, really. This sleight of paw accomplished, she saunters to the bench outside the back window. She jumps up. She lies down. Another two-hour hiatus while essential slumber interrupts play. Finally, and with infinite tolerance, she gets down and walks the one-foot chasm between the bench and the cat flap. Where she miaows, like an air raid siren, without pause or mercy, until some poor sap opens the door. Why use the cat flap, when there’s some sucker on the other side of the door. Her journey is typical of the domestic cat. These creatures are spirits of place, and like a ghost anchored to a haunted gallery, they float close to home. You may have seen maps of cat journeys. They always make me laugh out loud, they are so extremely, ridiculously local. It occurs to me these little four legged spirits have the secret of a happy life somewhere in their perfectly formed minds. All they have to do is land on their four feet with an owner who loves them. This accomplished, their life is generally one in which worry must play a far smaller part than it does in the lives of most humans. Kit Kat has had times in her life when she was stressed- that’s not up for debate: but her life, following a well worn track round a well loved house and being let in by a well trained family: that has much to recommend it. I think Maddie envies the cat. Mad is a world-class worrier. She can worry anyone else out of the stadium in an Olympic worrying contest. First prize on the podium. I have watched the anxious shadow descend during the last week, as the first day of school approaches. Home and school, we’re all in the business of helping Mad not to worry. Over her ten years we have compiled a complex menu, a veritable feast of panic buttons. And as she’s by no means unreceptive, she has listened and learned. Worry, we have all found, works a lot like Kit Kat. It circles, treading the same ground, pressing the same buttons. But unlike our languid furry friend, it is frenetic. It prods our sore and fearful spots, agitates our spirits, pokes and prods mercilessly. The trick, Maddie and I have found, in our efforts to stop this cycle, seems to be to trip the worry up. We’re not talking about huge life events here. Controlling inner dialogue at a time like that is like trying to steer the Titanic back home. No: we are dealing with that wheedling inner voice which takes the real events you have to deal with, and sows doubt. JRR Tolkein called him Wormtongue. The allegorical figure appears throughout folklore. If we let him have his way he can paralyse us entirely. Because he is like those mediaeval pictures. Mediaeval British art magnifies those it sees as important. Kings are huge, saints tower over their cowardly miniscule captors. It was their way of according significance to those in their world they felt deserved it. We can make worry more significant. Mad and I have learnt there are ways to stick out your foot at that vital moment, and derail the huge figure as it capers devilishly on its way. There’s not one easy answer. That would be trite. But one can fight him. And Worry, who never was very bright, swings round, interrupting his circle to check out what you’re talking about. It’s called distraction. The circle is broken, just for a moment, and the towering mediaeval figure loses some of his stature. We find he looms just a tiny bit less. The distraction can be a scheme for the weekend, a fabulous film with popcorn: it can be a list to organise oneself: it takes many forms. In fact the more varied the distraction, the better. But he will look, and he will trip. Of course, what he lacks in wit, he makes up for in persistence. He’s soon back at his antics, round and round. Tripping him up is an age-long, day-long, life-long process. But over the years we have found that while he never goes away, we can make him smaller. Maddie has been tripping him up constantly over the last few days. She was gleeful as she showed me the latest index cards she has prepared to reduce the concerns of returning to school to their correct proportions. And she has been given a beautiful present by a good friend, only today: a set of Guatemalan worry dolls. She tells them the worry, they sleep under the pillow, they take the worry away. Put that in your pipe and smoke it, you great big ugly goblin. Posted in Shrewsday MansionsTagged cats, worryBookmark the permalink. paraphrase Descartes “I worry, therefore I am” … we all have to survive (or not?) . Sorry to hear about the migraine, may it be short. You do seem to be in the wars lately – hope that migraine disappears ASAP! I like the sound of those worry dolls – you can also blow up balloons with your worries and then deflate to let them go. Oh, now I love that idea. Especially the fruity raspberry as the balloon flies round the room. I think I might have to test drive that one. Maddie is a genius- index cards to challenge that mean old worry: I always learn something here! Take the time in the darkened room and forget about the world. Sorry about the migraine. Hope it passes soon. Hope your migraine has gone away, and stays away! these worry dolls are so adorable…. I have a friend who keeps getting the migraine attacks so I just wish with my magic wand “pooph” …. Hope you are feeling better soon, Kate. Oh, heck, oh heck, oh heck! Hope that this migraine will be short-lived and you’ll feel better soon. Distractions are the supreme antidote to worry, aren’t they? Works for me every time. May this stint in the land of migraine-hell be over swiftly, Kate. Ah, well, Debra: in the 18 months or so since I wrote this Maddie and I have been very fortunate. We have worked on a mother and child scheme based on cognitive behavioural therapy – you probably know it well, a fabulous way to put each life event into perspective and remove some of the sting. In honesty it has changed both of our lives: and improved life for our family amazingly. Yes, distraction helps us to remain firmly rooted in the NOW ~ watching the movie, reading the book, eating the dinner, singing with Elvis the worry doll, learning something new, etc.. Which is why migraines are such a PAIN. They are so insistent in their screeching that I find distracting myself almost impossible. I’m glad that your Maddie is finding some tricks to trip Worry up. Thanks Angela, great advice 🙂 I am sure you are right: silence will win the day. Do you remember, kate, when you were all little and had a bad dream, I would breathe a good dream into your pillow. It worked like a charm, I think.